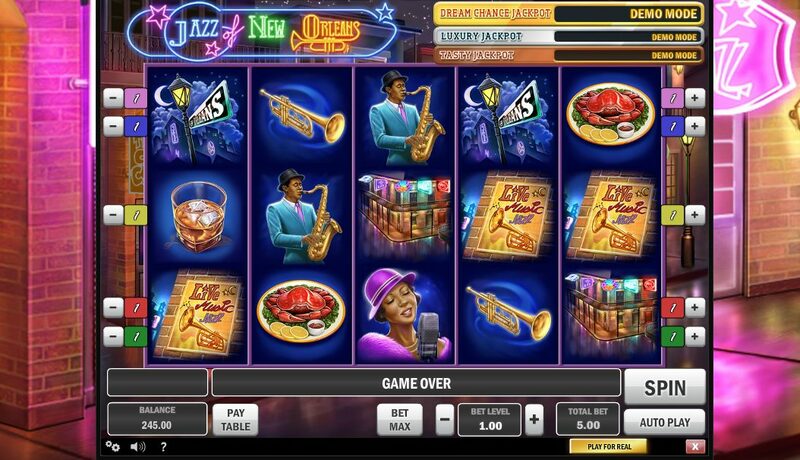 Boasting only 5 pay-lines, the simplicity of the betting isn't the only thing that's a little retro about slot developer Play'n Go's music-themed slot, Jazz of New Orleans. Set in the Deep South Louisiana city, Jazz of New Orleans is positively dripping in neon, nightlife and music, with some symbols to match the vibe. 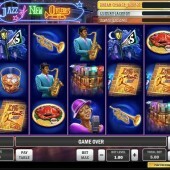 If you're looking for a comparative slot then look no further than Playtech's funky The Jazz Club slot. On the five reels we get a moon, a sultry female chanteuse, a sax player, some piano notes, a trumpet, a New Orleans dive, a street sign, a traditional New Orleans lobster dish, a glass of whiskey and a gig poster. The game's Wild is the neon Jazz of New Orleans sign which substitutes for all regular symbols in the game other than the Scatters. Three or more consecutive Wilds anywhere triggers the bonus game. In the bonus you have a choice of five neon club signs to pick from. Select a sign, pick a musical instrument to play - drums, sax, etc - and by doing that you will have decided your spins total and multiplier. You can bag up to 25 free spins with five extra Wild symbols included. You can also re-trigger the bonus up to 200 spins. There's Also a Progressive Jackpot! Interestingly, Jazz of New Orleans boasts the same progressive jackpot style as this developer's Mr Toad slot, with a choice of three jackpots up for grabs. Look out for the gold ring which surrounds some of the icons. If you hit three or more on the reels when betting the maximum you will have the chance to win one of three progressive jackpots: the smallest Tasty Jackpot (triggered by three Scatters), the Luxury Jackpot (triggered by four Scatters), and the Dream Chance Jackpot (triggered by five Scatters). In each case you will get a spin of the Wheel of Fortune; land the wheel on the >>> segment and you will progress to the next wheel. If you like the look of Play'n Go's progressives, get over to a local online casino offering Mr Toad. However, a more lush take on nightlife can probably be found in Betsoft Gaming's awesome Latin-themed At the Copa.